Cloth diapers can save you money, period... but Sunbaby one size diapers are even more economical than most other brands! We received one Sunbaby diaper to try out. This diaper came with one microfiber insert. My first thoughts: Adorable diaper! We LOVE this diaper..... LOVE IT! The Sunbaby fits Annabelle wonderfully! See how trim this diaper is! If you look closely at the picture just above this sentence, you may be able to see the elastic marks on Annabelle's legs from her previous diaper. The Sunbaby diaper is much thinner in between her legs, and I am sure that makes it much more comfortable for her! The Sunbaby diaper features hip snaps, to help provide a better fit for baby's thighs, three rise adjustments to ensure a proper fit as your child grows (recommended for 7-35lb children). The Sunbaby also has great leg elastic and elastic along the back of the diaper (seen below). The back elastic has successfully saved us from many explosions! I also have to say I have a love/hate relationship with the back flap. I love that it is there to help prevent leakage, and prevent the insert from touching baby's skin. I don't like that I occassionally have to "get my hands dirty" when the diaper is especially soiled and I need to remove the insert. Usually, I love it. I also love the line of PUL that is in the inside. This bit of fabric covers the snaps and helps prevent wicking. This is very helpful to us since Annabelle always rolls to her belly and is always very wet in the front. 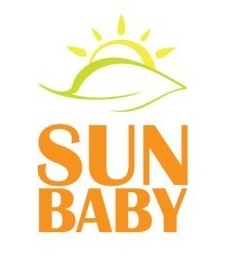 Sunbaby diapers are made in China... but that's because the owner of Sunbaby LIVES in China! Sun pei, of Shanghai, and her husband are the owners of Sunbaby. Sun pei decided to get into the cloth market when she was shopping for her then 5 month old baby. She and her husband had a rough time in the beginning, but soon found a partner who had a small factory in their city. Together they collaborated and made Sunbaby what it is today. Definitely one of our go to diapers. Price: $5 or less per diaper. Before my 4mo daughter was born, I did a lot of research into cloth diapers. We couldn't afford to pay a lot of money out at once, so I decided to order 12 sunbabies..... When my daughter turned 3 weeks old, we started using the sunbabies. They were pretty fluffy on her, but worked great. I ordered 12 more, and now sunbabies make up the majority of my stash. I show the cute patterns of to everyone, and they are all in awe of how easy cloth diapering is now! We <3 our sun baby diapers! Perfect for the budgeted family who wants to use pockets. Glad to see Sunbabies on here. I have some for our baby on the way and am excited to try them out and maybe buy more. I bought five and SunPei was totally helpful in accommodating me since I didn't want the lot of 12 just yet. I'm planning to purchase some from Sunpei. What are recommendations between the 2.0, 3.0, or 4.0? Currently, I'm just using cotton prefolds with Kawaii covers. But want to add some pocket diapers. Thanks! I believe we received the newest version to try out, so I would recommend that one. Brandi- I have since purchase 24 Sunbaby diapers! I still love them! I do have a couple "duds" that just aren't as good as the rest, but overall, I LOVE mine! Thanks for the review... I am hoping to order some of these... I can't figure out on their website, though, what prints are available, and how to select them... do you know? :) Thanks! To purchase Sunbaby Diapers you click on the package you want to view, then underneath the picture of the diaper there will be thumbnails of the prints available. In the text box to the right you place your order, such as 1x Red, 1x Minnie Bows, etc. Or you can choose random or all the same. :) Hope that helps! Just to add to this you can also go to SunbabyDiapers.ca which is a Canada affiliate for Sunbaby Diapers. They distribute to Canada and the United States and it only takes about 3 - 5 days to get your diapers as opposed to 6 weeks from China. You also don't pay customs and you can order 1, 2, 3, etc diapers instead of 12. I have dealt with the owner and she is fantastic with customer service as well. I had tons of questions and she was able to answer all of them. Just a thought!